Water based white paste of high viscosity with excellent water and climate resistance. Even after mixed with paint, paint colour remains almost unchanged, having an opaque matte effect. Please note that when it is dry about 40% of lean occurs. To dry about 3cm of paste completely, it takes about 3 to 6 days at a temperature 20 ℃. Water based white paste of high viscosity with elasticity and excellent water and climate resistance. Has an opaque matte finish when used as it is. It becomes a little bright in colour when mixed with paint in large quantities. After drying it becomes about 1/5 lighter than the other modeling paste. Please note that about 30% of lean occurs. Water based white paste of high viscosity with excellent water and climate resistance. Has an opaque matte finish when used as it is. When mixed with paint it becomes pastel in tone. Please note that when it is dry about 40% of lean occurs. To dry about 3cm of paste completely, it takes about 3 to 6 days at a temperature 20 ℃. It has a rough distinctive texture. When mixed with paint the variety of texture can a change depending on the amount of gel. A white water based paste, it becomes a matte film after dried. Has excellent water and climate resistance. Milky white colour water based paste. Becomes transparent when dry. 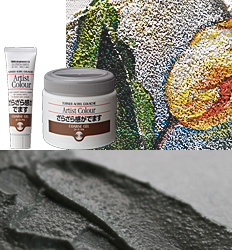 Coating has flexible texture, an excellent water and climate resistance. When used to mix with the paint, it provides an exciting shiny and clarity thick coating. More mixing will increase the gloss and transparency. Milky white colour water based paste. Becomes matte and transparent when dry. The firm coating has an excellent water and climate resistance. When mixed with a paint, provides the effect of transparency without the gloss. 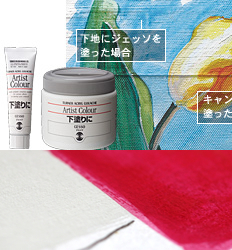 It is a white paint primer with excellent covering power and adhesion. 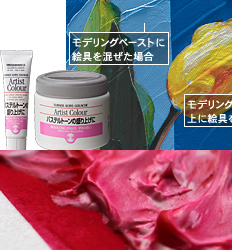 It will reproduce the vivid colors of the original paint. After diluted with about 30% of water, please apply with a brush or roller. Two coats overlaying can provide more smoothness. At a temperature of 20 ℃ it takes about 30 minutes to dry, to the touch, and about 2 hours before the second recoating. Use Glass Primer on glass before painting to allow the paint to adhere strongly to the surface. Use Wood Primer on wood before painting to allow the paint to adhere strongly to the surface. Use Metal Primer on metal before painting to allow the paint to adhere strongly to the surface. 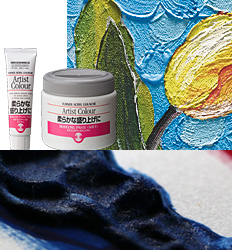 Use Fabric Medium by mixing it with Acryl Gouache colours to allow to adhere to fablic surfaces. Milky-white liquid that dries to a transparent and water-resistant film. Can be used as a final coat to add gloss on art work as well as mixed with paints. The more amount you mix the varnish with a paint, the glossier, more transparent and better adhesion the paint is. Please note that Gloss Varnish is not removable once dried. 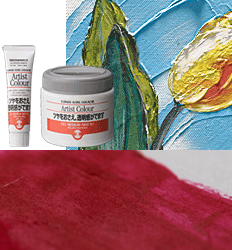 Slows the drying time of paints to enjoy a watercolor-like gradation technique or to achieve smooth surfaces without brush strokes. Please note that using too much Retarder may cause the surface to remain tacky for one or two days. Brush cleaner for Acryl Gouache. Can remove paint from the brush fully and quickly without deteriorating the brush. Odourless and no risk of fire. Offers an excellent washing ability for a long time. Milky white colour, soft, sticky water based paste. Becomes transparent when dry. 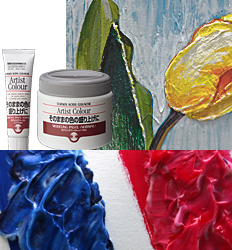 Mixing with a paint, provides soft and smooth brush painting. The more medium, the more softness, smoothness, gloss and clarity increases. 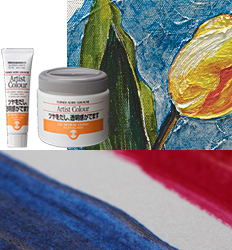 Turner Acryl Gouache Mediums help you achieve a wide range of effects with your paints.